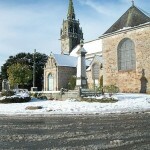 The St Pierre parish church was completely rebuilt between 1718 and 1731, except the church tower which dates back, for the most ancient parts, to 1620-1622. 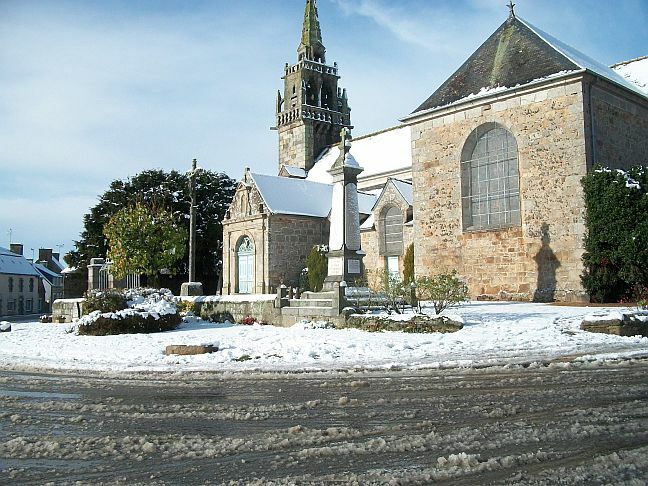 Only the church tower is registerd on the supplementary inventory of the MONUMENTS HISTORIQUES on December 17th 1926. 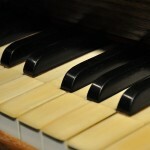 Built by the organ-builder Karl HEYER in 1866. 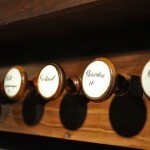 Checked by the organ-builders Claude Madigout and Jean-Pascal Villard. Inauguration by the late Jean BOYER. The front, sheltering the lowest pipes of the Open Diapason is made of two plate-faces of twelve pipes between three towers of 5 pipes each. The highest being in the centre. Each tower has a finely sculpted base. The sky-blue vault offers a beautiful setting to this classical case that was often made in France during the second part of the XVIII century. The front of the case is made of oakwood ; the back,the sides and the ceiling are made of pinewood. 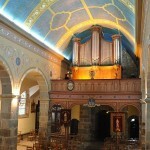 To be compared with the front of the the Heyer organ of Plouzévédé (29), a flat version of the one in PRAT. 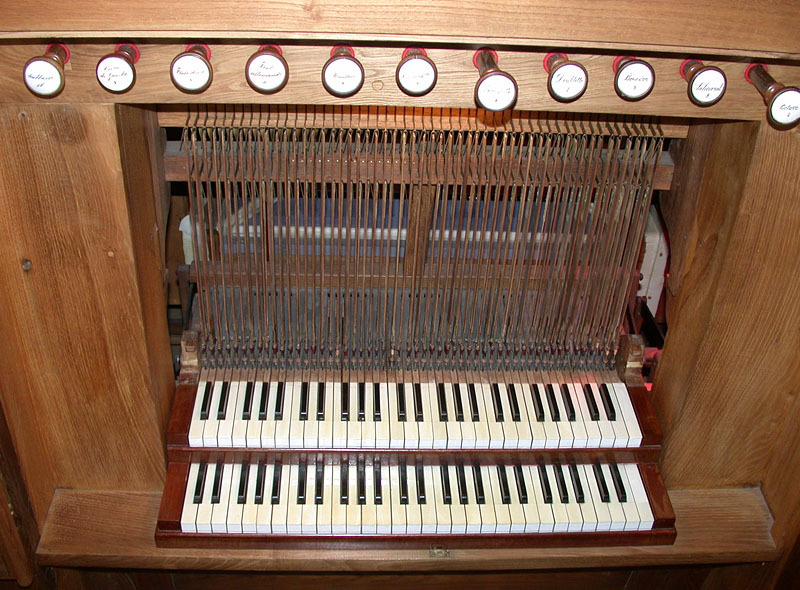 The console is in a window on the left-hand side of the instrument (in the dutch style) : only one keyboard, ten stops, a pedalboard in pull-downs (tirasse ?) without its own stops. 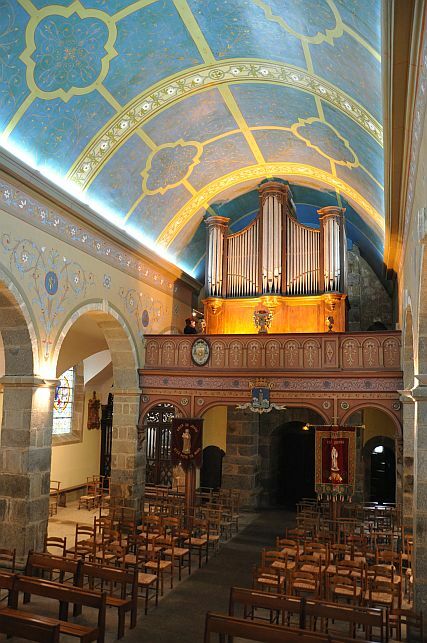 Also see the console of the Heyer organ of Plougasnou, of the same model, on the site of the organ-builder Toussaint. The instrumental part is registered : M.H. 22.02.1984. On the gallery down the nave. 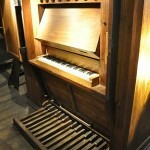 It is a noble little liturgical instrument, slighly rustic in its ergonomics but magnificent for its sounds, both refined when heard separately and making a generous plenum, not exempt from some “Gravität” as they say beyond the Rhine : only one keyboard, ten stops, a pedalboard in pull-downs without its own stops and a side-console. 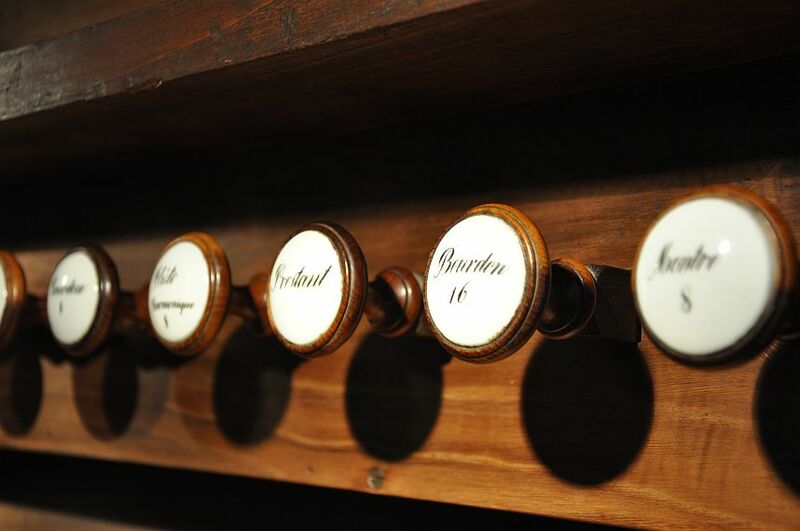 All the pipes are cut to the sound (classical heritage whereas at the same period and for several years, Cavaillé-Coll or Merklin for example had been harmonizing their pipes with notches of chords in order to find « new » sounds. Maintained by Bernard HURVY-7, avenue Telstar. 44300 NANTES. Very good, with little reverberation. 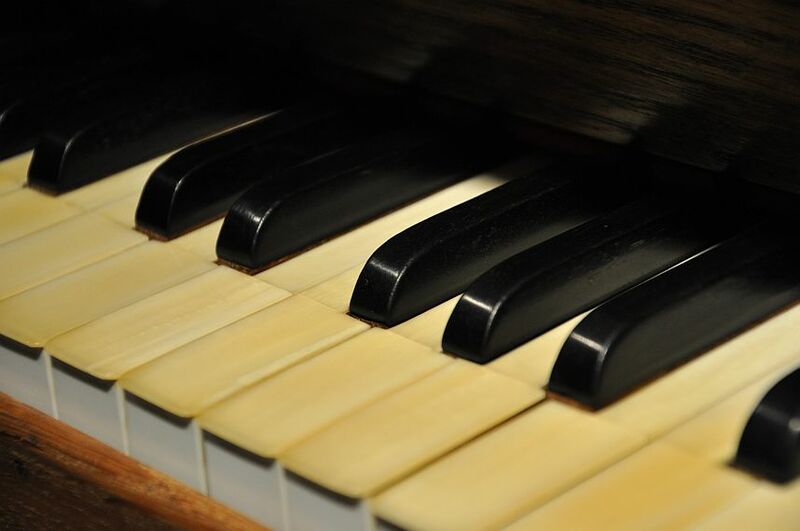 A manual keyboard with 54 notes. A pedalboard in pull-downs with 25 notes (the spacing between the keys is slighly wider than usual, designed in duckbills ( ?) in the German way. Console in a window on the left-hand side (In the Dutch style). Mechanical transmission of the notes and stops. 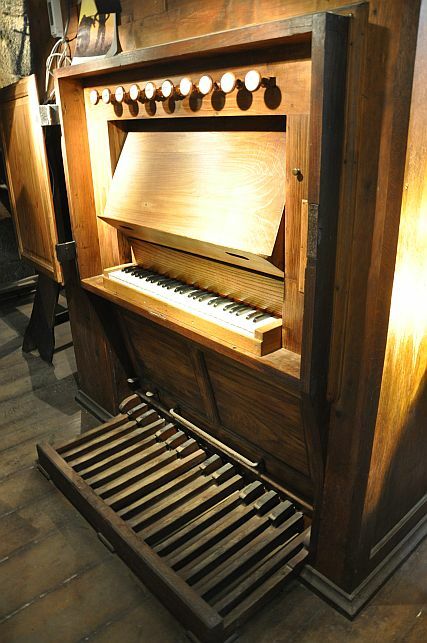 The HEYER organ of Rumengol (29) in its case by Thomas Dallam is pretty much the same in its conception and its composition -16’bourdon and tremolo apart. (model with one keyboard, pedalboard with pull-downs, 9/10 stops). Expert report by Jean-Pierre DECAVELLE , technical advisor. Regular concerts during about ten years, rare these days. Yves FECHANT, the son (YVON) until 2012. YVES FECHANT, the father until 1966. No reference before. Today : Laurent LE BOT.